What good is an expensive mattress without necessary protection? The ideal way to maintain your investment’s lifespan is to purchase a high quality protector. Unfortunately, many mattress protectors may negatively impact the feel of your mattress and may leave you sleeping hot. In this review I dive into one of Nest Bedding’s products, the Cooling Mattress Protector. Nest Bedding aims at a high quality protector that keeps out allergens, dust, and moisture while also maintaining cooling properties.Will this cooling mattress protector have the properties you’re looking for? Keep Reading to find out! Not enough time to read the full review? Click here to find the full summary. 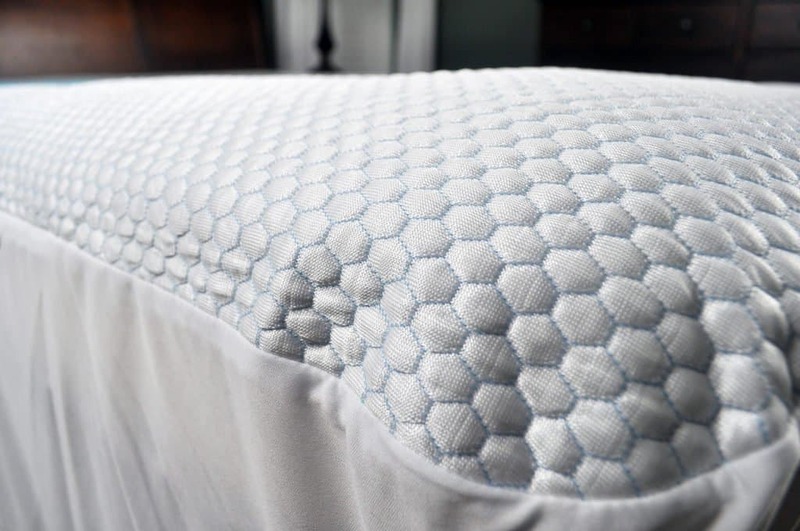 The Nest Bedding Cooling Mattress Protector is a 5-sided waterproof protector, constructed with a cotton-polyester blend and a breathable membrane backing for cooling and protection. 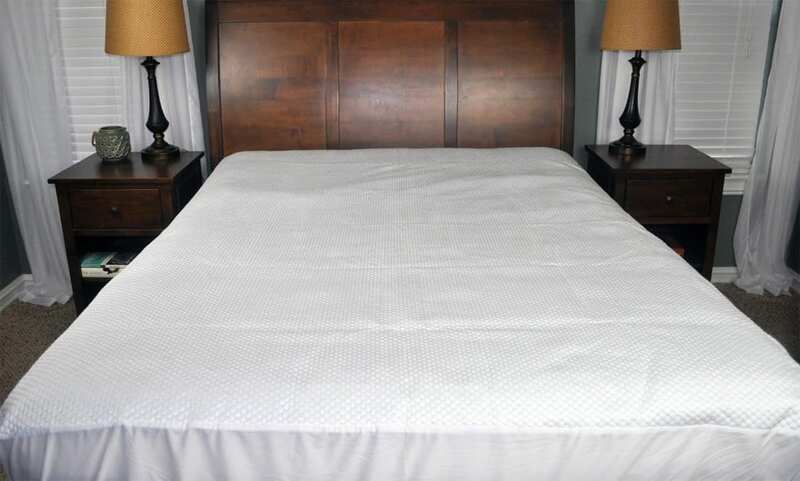 This mattress protector is designed to regulate body temperature and create a cooler surface. The purpose of the mattress protector is to keep out unwanted objects such as dust mites, allergens, and even spills, all while keeping your mattress cool and breathable. The sides of this mattress protector are a thinner cotton than the top of the protector, and provides a nice degree of stretch. Nest Bedding offers the mattress protector in Twin, Twin XL, Full, Queen, King, and California King and can fit mattresses up to 18” deep. This protector is machine washable on cool settings and can be dried with cool or no heat. The Nest Cooling mattress protector, as with any good mattress protector, aims to accomplish two main goals- complete protection of the mattress while all under a stealth-like cover. Protect the mattress – This includes protection from liquids, particles, and even allergens like dust mites. Protect without knowledge that it’s there – A good mattress protector will offer full protection without effecting the feel of the mattress below. 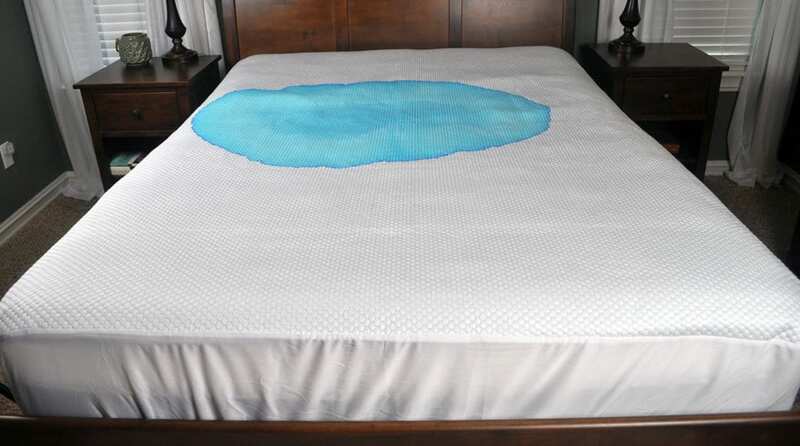 Liquid spills are one of the most common types of spill to befall a mattress which makes liquid protection absolutely essential to protect any good mattress. Without a good mattress protector, liquids can penetrate mattresses and harbor bacteria, smells or other damage that could void your warranty. To see how the Nest Bedding Cooling mattress protector compares, I ran a series of tests to evaluate its protection against liquid spills. This first test demonstrates the effect of a quick and noticeable spill. These types of spills include things like spilled drinks or sudden incidents that you catch just as they happen. This gives you the chance to clean up the spill before the liquid can fully soak in. Can the Nest Cooling Protector defend itself from this quick spill? Spill Test: For this test, I dyed 16 ounces of water and poured it onto the protector. After 2 minutes, I used paper towels to soak up the excess liquid and threw the protector in the wash on a normal cycle. After Wash Cycle: After a standard wash/dry cycle, there were no signs of color retention or staining on the mattress protector. This protector was restored to like-new condition, despite the unfortunate spill. This second spill test demonstrates a more inconspicuous spill. You likely didn’t see it happen and may not notice it until you’re crawling into bed at night, giving the spill 8 hours or longer to sit. It survived the 2 minute test, but will 8 hours be too long for the Nest Cooling protector? Spill Test: For this test, I dyed 16 ounces of water and poured it onto the protector. After 8 hours, I used paper towels to soak up any excess liquid and ran the protector through the wash on a normal cycle. After Wash Cycle: After a standard wash/dry cycle, there was no sign of color retention or staining on the mattress protector. Despite the longer test duration, this mattress protector was able to completely protect the mattress. This mattress protector does claim to stop allergens and dust mites from impacting your mattress. As a 5-sided protector, the protector will not be as impervious as a 6-sided mattress protector, concerning allergens, but the membrane backing to this protector does provide a thick and waterproof backing. A backing like this makes it difficult for dust and allergens to get into the mattress.That being said, if allergy protection is a critical factor for you, I would recommend a 6-sided protector that is specifically designed for allergy protection. The Nest Bedding Cooling Protector is quiet, despite its use of polyester backing. The top feels slicker than a standard sheet, but not at all ‘scratchy’ like other waterproof protectors may be. There is a soft hexagon quilted pattern in the top layer which gives it a nice feel. Regarding cooling, this mattress protector is one of the best I have tested to date. 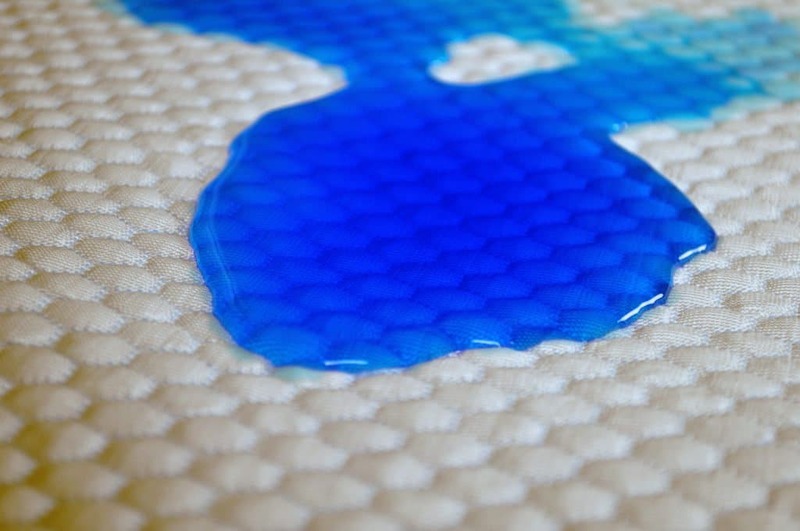 When used on a memory foam mattress, there was a noticeable difference in cooling on the surface of the mattress. Smell – moderate smell when initially opened, bit dissipated after a few hours. Completely gone after first wash.
Should I Buy the Nest Bedding Cooling mattress protector? Want great cooling – The choice of materials and breathable membrane provides great cooling for this mattress protector. It is slick and cool to the touch and helps to keep sleepers cool all through the night. Want a waterproof, yet breathable protector – Sometimes waterproof protectors can be scratchy or retain heat. That is not the case with the Nest cooling protector. 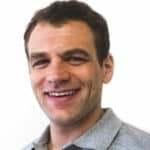 The backing is actually a breathable membrane that allows air to circulate while still protecting from liquid, particle, or allergy irritants. Want an extra deep protector – This cooling protector has ultra deep pockets and can fit mattresses up to 18” thick. I tested this on a 12” mattress (the Alexander Signature by Nest Bedding) and I found there to be quite a bit of extra play in the protector. If you are looking for an ultra snug fit for a standard mattress, this may not be the protector for you. For more information on the Nest Bedding cooling mattress protector, check them out at nestbedding.com. 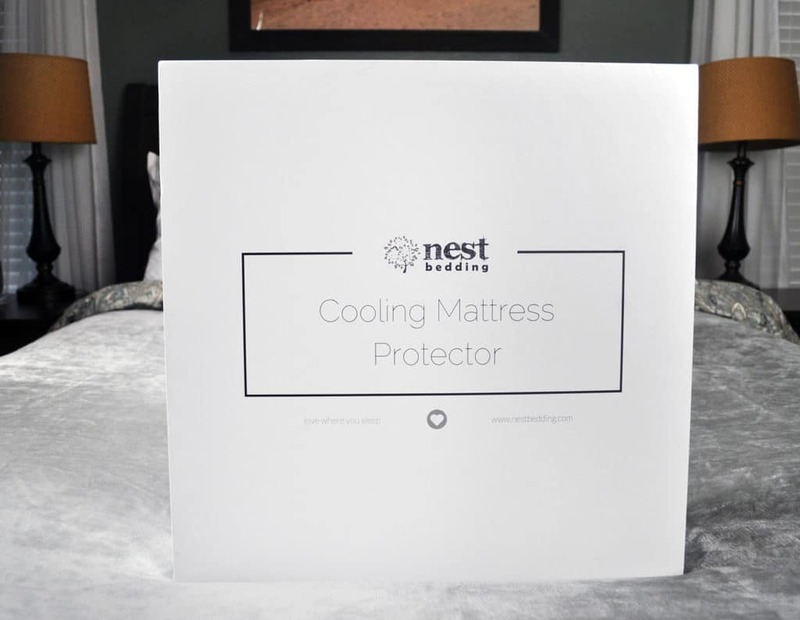 For sleepers looking for a mattress protector that won’t add a layer of warmth to their mattress, the Nest Bedding cooling protector may be just right for you. Cool to the touch, this protector did a great job of dissipating heat throughout the night while also protecting the mattress from particle and liquid spills.